Chocolate-covered espresso beans are a delicious treat that appeals to both coffee lovers and chocolate addicts. Some people think chocolate-covered espresso beans are a junk food, but they actually pack a healthful punch, as well as a flavor punch -- both chocolate and espresso contain antioxidants and might help prevent certain diseases. Both chocolate and espresso beans contain antioxidants, which are substances that neutralize free radicals in your body. Free radicals are harmful compounds that can damage and cause inflammation of your tissues, leading to poor bodily function and increasing your risk of illness. Coffee beans contain oxazoles, phenols and volatile aroma compounds that all have antioxidant properties. Chocolate contains antioxidants called flavonoids, which help lower your blood pressure, raise levels of good cholesterol in your blood and improve the function of your vascular system. Dark chocolate and cocoa powder contain the most flavonoids, so select chocolate-covered espresso beans that are covered with dark chocolate. A study published in a 2011 issue of the "Journal of the National Cancer Institute" indicates that men who consume more than six cups of coffee per day have a decreased risk of fatal prostate cancer. Regular coffee consumption also significantly lowers your risk of developing type 2 diabetes, according to researcher Dr. Rob Van Dam in the 2005 "Journal of the American Medical Association." Coffee consumption is also associated with a decreased risk of heart disease and cirrhosis of the liver, according to a 2006 article published in the "New York Times." 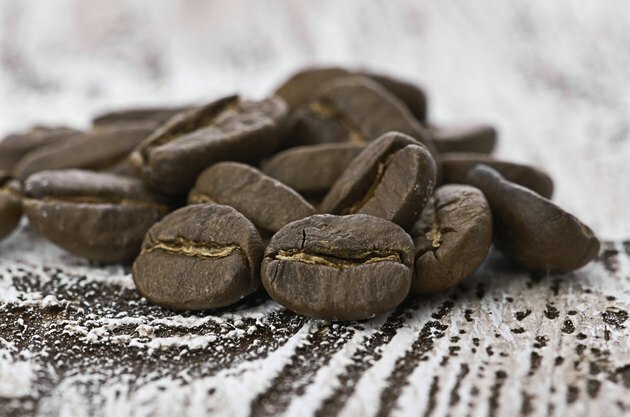 Studies specifically on espresso beans have not been conducted, but the beans contain more healthful components that are lost when they are turned into coffee. Chocolate-covered espresso beans might improve your mood because both coffee and chocolate impact how you feel. Coffee interacts with the chemicals dopamine and acetylcholine to make you happier, but the effects are short-term, and critics warn that people with depression might experience heightened symptoms later on because of crashing and fatigue. Dark chocolate increases brain levels of serotonin, another chemical that alters your mood for the better. Each chocolate-covered espresso bean contains 5 milligrams of caffeine, a stimulant that elevates your heart rate and blood pressure. Overconsumption of caffeine can lead to nausea, vomiting, tremors, restlessness and difficulty sleeping. The tastiness of chocolate-covered espresso beans makes them easy to eat, so monitor your consumption. The University of Maryland Medical center advises that 250 milligrams of caffeine per day is a moderate intake, while excessive intakes exceed 800 milligrams per day.